THIS MONTH: A look into the future of CD-ROMs, and pinball plaudits. Arthur Leyenberger is a human factors psychologist and free-lance writer living in New Jersey. He's been an Atari enthusiast for over five years. When not computing, he enjoys playing with robotic toys. I've seen the future and the future is almost here, depending upon which computer you own. You see, I've just returned from the first CD-ROM Expo, held in New York City. To refresh your memory, "CD-ROM" means Compact Disc-Read Only Memory. Read Only Memory (ROM) is a concept familiar to most of us. The Atari ST contains six ROMs which hold the operating system, about 192,000 bytes. 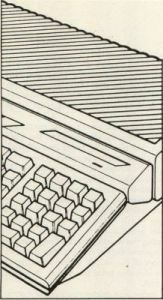 The information in the ROMs—GEM desktop, Input/Output routines, etc.—is permanent and can only be read by the computer. Another example of ROMs: cartridges used in Atari and other video game machines. The CD used for the storage medium is similar to the Digital Audio Disc (DAD) that holds up to 73 minutes of music and is played on a CD player. The difference, of course, is that CD-ROMs contain data to be read and interpreted by computers. This data can take many forms: programs, databases, dictionaries, encyclopedias, or any other collection of information. The amount of information that can be stored on a CD-ROM is staggering—550 megabytes, or the equivalent of 1500 IBM PC floppies, 700 double-sided ST disks or 6000 Atari 8-bit floppy disks. DADs and CD-ROMs both use players in which a laser shines a beam under the disc and detects the presence—or absence—of microscopic pits on the disc surface. A pit is a 0 and no pit is a 1; thus, the binary code used by all computers. The audio players use error correction procedures and rely on the human ear to mask brief gaps in the music, which can be due to temporary losses in reading the data from the disc. A few bytes missing from Bruce Springsteen's Born To Run is unlikely to be noticed. On the other hand, a computer cannot interpret absent data, so the CD-ROM drive must have greater precision and cause fewer errors when reading the data. Atari's blast from the past. My primary interest in attending this show—which was billed as "The first ever user-oriented CD-ROM conference and exposition"—was to find out when this technology was going to become inexpensive enough for home use. You may recall that, at the 1985 Summer CES, Atari showed a CD-ROM player and Grolier's Encyclopedia running on the ST. The CD-ROM drive was connected to the DMA port of the ST, and Activenture's (now called Knowledge Set Corp.) GEM-based Knowledge Retrieval System (KRS) was used to access the encyclopedia. At the time, Atari announced that the CD-ROM player would be available by the following fall, for "under $500." Two years later, Atari has yet to introduce a CD-ROM drive, claiming that the prices have not fallen enough for a $500 retail price. This is true. Drive prices have fallen under the $1000 level, but, by the time you add even one application package (such as an encyclopedia), the cost climbs back up to the $1000 mark—a price that's hardly affordable by users whose computers cost half that much. But progress is progress, albeit slow. The consumer side of the technology has shown that, as CD player prices dropped near the price of a decent cassette deck (about $200), the demand for audio CDs skyrocketed. Perhaps when the CD-ROM player price drops to the level of a decent peripheral—such as a printer, color monitor or hard disk—the computer side of the technology will also take off. Regardless of the current affordability of drives (or lack thereof), there's good news to report in several areas. As mentioned above, CD-ROM drive prices are falling, and several people I talked to agreed that, within the year, an under-$500 drive was reasonable. Second, the thorny tangle of data storage standards has been sorted out. Until recently, there were no set standards for how data was represented on the disc, the use of volume and file structures, and how directories and paths should be organized. Although every CD-ROM disc could be played on all drives, the software used by the computers to read the disc wasn't the same and caused tremendous compatibility problems. The lack of standards in the past has inhibited the growth of CD-ROMs, to be sure, but that hurdle has been overcome, since almost all CD-ROMs now use the so-called "high-Sierra" format. Most significant were the introductions and demonstrations of new and existing CD-ROM application packages that one might actually want to use at home. Of the thirty-odd vendors at the Expo, Microsoft had the most exciting product: Microsoft Bookshelf. If you do any kind of writing, whether it be term papers, reports, or computer articles—anything—the Bookshelf's collection of ten of the most useful reference works will certainly make your writing easier—and better, as well. On one compact disc, the Bookshelf contains a dictionary (American Heritage Dictionary with over 200,000 definitions), a couple of style manuals (Chicago Manual of Style, Houghton Mifflin's Usage Alert), Bartlett's Familiar Quotations in its entirety, an almanac (World Almanac and Book of Facts), a thesaurus (Roget's II: Electronic Thesaurus with 500,000 synonyms), a spelling checker (Houghton Mifflin's phonetic Spelling Verifier and Corrector), a collection of over 100 form letters, a guide to business information sources, and the complete U.S. zip code directory. Microsoft Bookshelf is a memory resident program that works with any IBM PC word processor. It's always ready to help in the background, making it easy to gather facts, find errors, or come up with just the right word. You can use a word in your document to trigger a search in any of the references, or you can enter your search criteria directly in a dialog box. Once the program has found the information for you, it can be copied from the reference library to your document automatically. Microsoft Bookshelf retails for $295 and requires: an IBM PC or compatible with at least 512K bytes of memory; two disk drives or one disk drive and a hard disk; MS-DOS 3.1 or higher; a CD-ROM drive; and the Microsoft MS-DOS CD-ROM extensions. At this time, Microsoft has no plans to support the Atari ST, although certain company representatives (who asked to remain nameless) agreed that the ST would make an excellent engine for CD-ROM data retrieval. No doubt, once the CD-ROM drive prices do down, the ST will make a logical machine on which to run CD-ROM applications. One of the best deals currently available to prospective CD-ROM users is the Laserdrive-1 CD-ROM system from Amdek. The Laserdrive-1 system contains the Microsoft Bookshelf, the MS-DOS CD-ROM extensions, a Hitachi CD-ROM disc drive and an interface card for the IBM PC or compatible. Interestingly, the Hitachi drive can also play audio CD—the only drive now available that's able to do so. Audio CDs can be listened to with headphones plugged into the front headphone jack, or by using the stereo line output jacks to connect the drive to a stereo amplifier and speakers. Not only is this a thoughtful feature, but it helps bring the price of the drive down, by not requiring you to purchase a separate audio CD player. If you want to check out this system, look for a Sears Business Systems Center near you. They carry the Amdek CD-ROM drive and Microsoft Bookshelf system. Another CD-ROM vendor at the Expo was Grolier. They were demonstrating their $300 American Academic Encyclopedia, that's very similar to their on-line electronic encyclopedia available through CompuServe Information Service. The Grolier's Encyclopedia was the first CD-ROM application for the general public. When you consider that the price of the 20-volume printed version is about $850, the price for this high-tech version—and a CD-ROM player—isn't all that high. Further, once you own the drive and have purchased the encyclopedia, yearly updates which are, in reality, entire new versions of the encyclopedia, cost under $200. The electronic version of the encyclopedia is not only cheaper than the book form, but results in faster and often superior information searches. The advantages come from using key words for the search criteria. Following the program's prompted commands, you type in one or more words to search. The retrieval software quickly finds every occurrence of those words in the more than 30,000 articles, and displays the list of articles containing the words. You can then select an article and display the text with all occurrences of the search words highlighted. You can also print the article, or save it to disk. Grolier was demonstrating their encyclopedia using an IBM PC. When asked about support for the Atari ST computer, John Cole, Director of CD-ROM products, replied that they're eager to support the ST—once the hardware is available for the consumer. He said, although Grolier is not a hardware company, he agrees that the ST would make an excellent vehicle for their product, and they'll be ready when Atari (or someone else) introduces a CD-ROM drive for the ST. There were other interesting CD-ROM applications being demonstrated at the Expo, as well. Bowker was showing their Books in Print product that will be of most interest and use to libraries and bookstores. Geovision was demonstrating their U.S. Atlas GEOdisc, a CD-ROM geographic database. The U.S. Atlas contains a number of separate data layers for the entire country, including roads, waterways, political boundaries, railroads, federal lands, plus a place and landmark file of more than one million locations that can be accurately situated on the geographic displays. Of course, there were all kinds of other vendors at the show, too. One company, Discovery Systems, was offering a special CD-ROM manufacturing deal. For $2000, they'll take your 550 megabytes of data stored on IBM PC floppy disks, and produce 200 CD-ROM discs for you. It's a good price if you need this type of thing—and many companies probably will do it. Think for a minute; if you had a CD-ROM player attached to your ST right now, wouldn't you pay $10, $25 or $50 for the entire collection of ANALOG and ST-Log magazines? I certainly would. But alas, the technology is still too young to make this a reality. The recent CD-ROM Expo in New York gave me a taste of what the future will bring. Before we know it, we will have CD-ROM peripherals hanging off our STs. Without even leaving the house, we'll be able to boot up with the Readers Guide to Periodical Literature, do a little searching for articles on Atari computing, then insert the Collected Works of ANALOG, or the Complete Byte Disc into the player. We'll access the specific articles of interest, spool them to the printer, take the output to our favorite easy chair and relax while we read the articles. Albert Einstein once said, "The whole of science is nothing more than a refinement of everyday thinking." I think I'm going to like the everydays of this future. The nice UPS man (before moving, I had a nice UPS woman) was just here to deliver a package from Accolade. Let's open it up and see what we have. Pinball Wizard. All right. I've been a pinball cuckoo since I was knee-high to a grasshopper. I love pinball games. Pinball Wizard is an arcade-style pinball simulation and construction set. Up to four players can play sequentially, using either the mouse or keyboard. There are four different pinball simulations, each offering a variety of obstacles. Each game consists of a pinball table complete with backboard, flippers, tilt sensors, table shake and more. The level of difficulty can be adjusted for each table by altering parameters like point score, slope, number of balls and elasticity. The Pinball Wizard building set features a parts menu containing targets, flippers, bumpers, discs and spinners that can be placed anywhere on the table. In addition to the obstacles, you can control the sensitivity of the tilt sensors, the speed of the ball, the slope of the table and the elasticity of rebounds. All of these settings are made by simply moving sliders with the mouse. A paint menu allows you to illustrate the table from a full palette of sixteen colors. If you really make a mess, there's an "oops" icon that deletes the last item painted. After a minute or so of inactivity while in "building mode," a demo screen begins showing the construction and illustrating of one of the default tables. After the table has been constructed, you assign point and bonus values to the targets and obstacles, as well as special combinations, such as double bonus, extra ball or additional game. The tables you create with the building set can be saved to disk for future play. Pinball Wizard retails for $35. I've played a lot of pinball games on the 8-bit and ST computers. Accolade's Pinball Wizard is one of the best I've tried. It takes full advantage of the color and sound capabilities of the ST, and features detailed graphics, lights and sounds that mimic a real game. If you enjoy computerized pinball simulations, or are looking for a new game for your ST, I highly recommend Pinball Wizard.